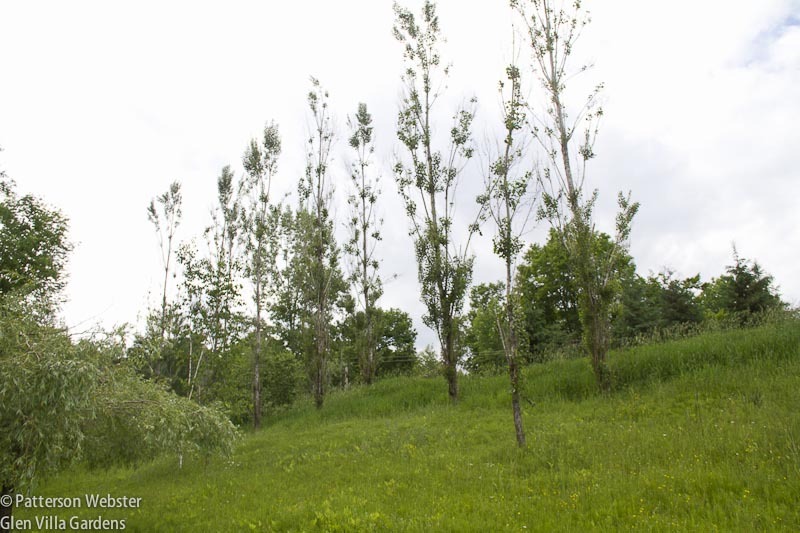 Trees play a major role at Glen Villa, my garden in Quebec’s Eastern Townships. 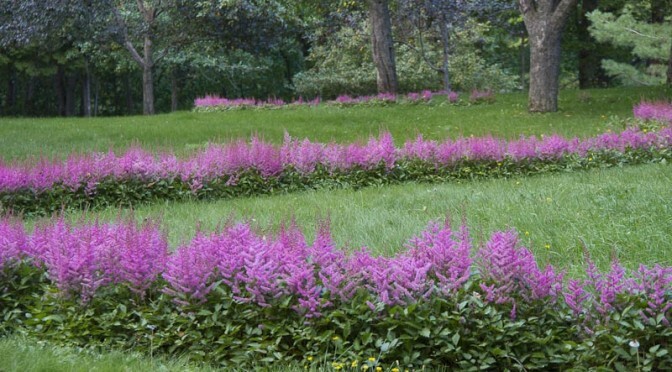 They provide shade in summer, colourful foliage in autumn and the promise that comes with spring green buds. In winter bare branches of deciduous trees offer a stark colour contrast outlined against the snow, and evergreens provide structure and a touch of colour in an otherwise muted world. Despite their many virtues, trees are not care-free. The old ones, in particular, need attention. 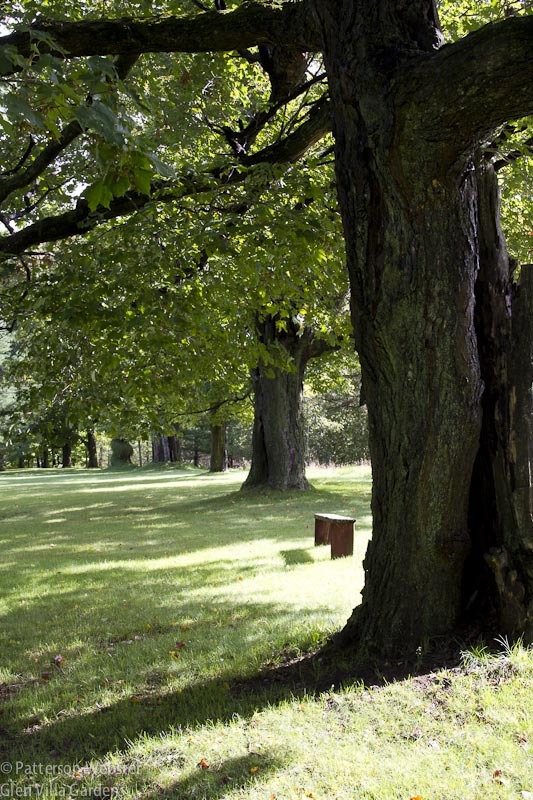 At Glen Villa we have trees of all sorts, sizes and ages; but we have LOTS of old trees, as you’d expect on a property that has been cleared and tended since about 1850. Some of the trees, like the maples below, date from the days of Glen Villa Inn, the large resort hotel that burned down in 1909. These maple trees have offered shade for over 100 years. They line the bank above the lake. An old asphalt path runs alongside them; it was built so that guests at Glen Villa Inn could stroll without getting their shoes wet..
Other trees date from the time the land was actively farmed. 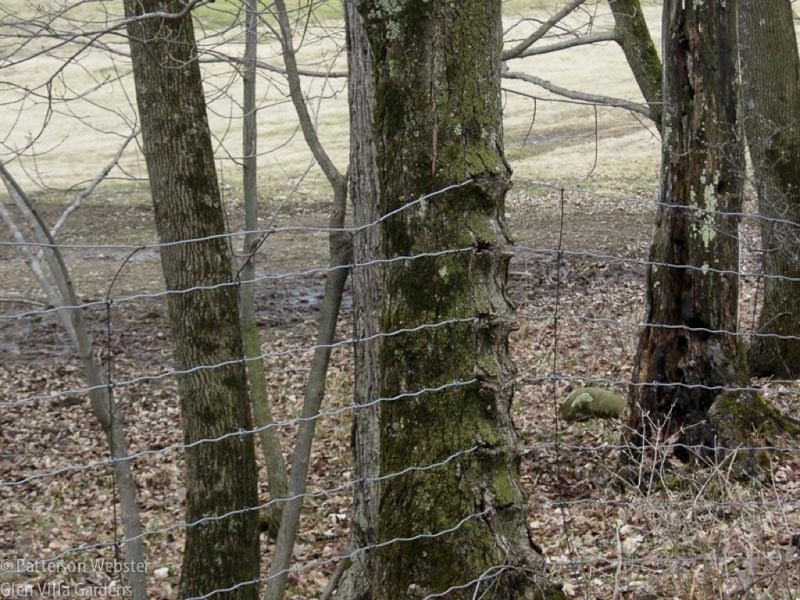 The maple tree has grown around the wire fence that separated an old farm field from the woods. Still other trees date from no time in particular. They are simply old, and the attention they need is to be cut down. 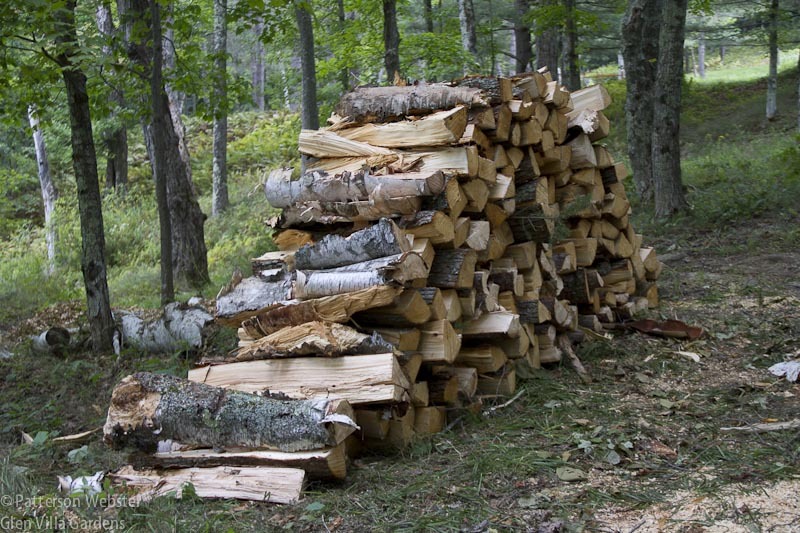 Some old trees cut down this past week will provide firewood for the winter. This little horse chestnut tree is always the first tree to change colour. I took this photo on August 12 this year — much too early to be thinking of fall. 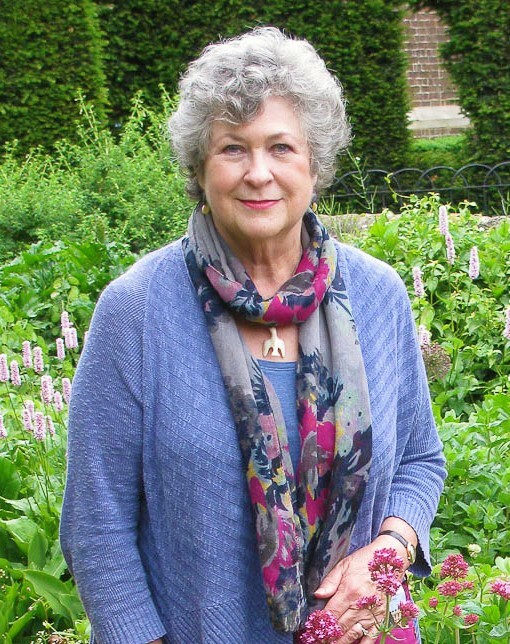 … others stand in groves. 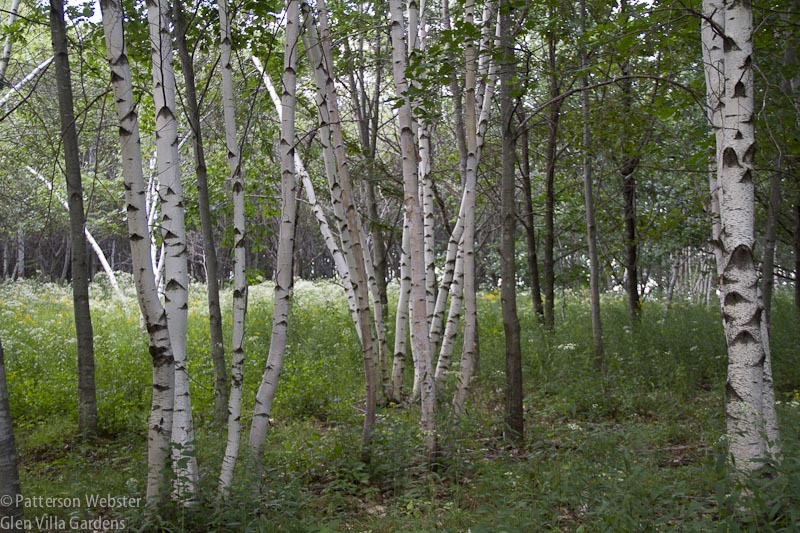 A grove of white birch trees is a beautiful sight in mid summer. Not bad in winter, either. 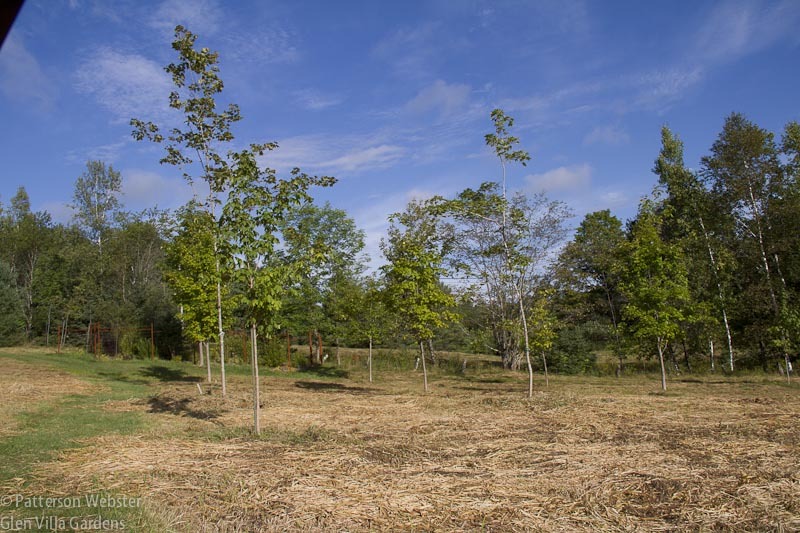 These ten maple trees in the Upper Field are the ‘grandchildren’ trees. One was planted the year that each grandchild was born. Not shown is tree #11. 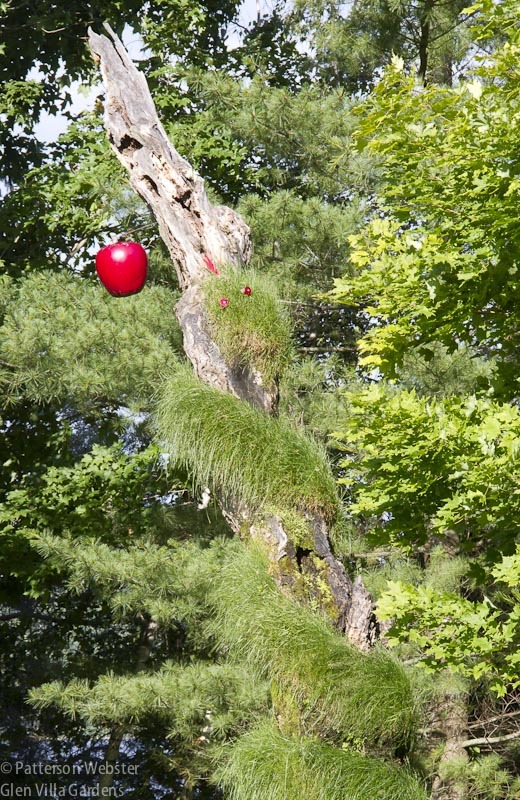 At the parents’ request, this tree isn’t a maple but an apple — a tree that bears fruit. … others show work we’ve done. 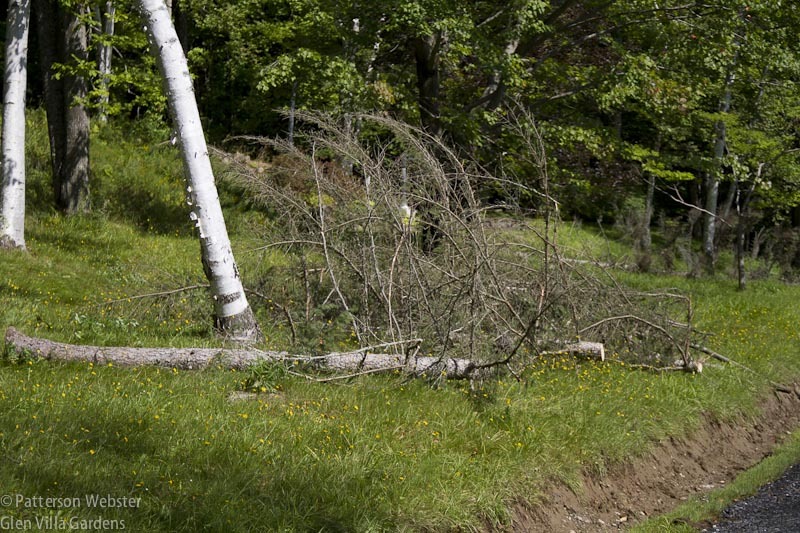 This birch tree was bent to the ground by an ice storm several years ago. We straightened it up gradually and now it stands tall. Unfortunately, the top is dead, probably as a result of the straightening. Last fall we topped and ‘knee-capped’ some Italian or black poplars (Populus nigra) by the Skating Pond. Here’s how they looked last July. Not very nice. The poplars on the berm by the Skating Pond were too tall and spindly. So we chopped them severely. I was nervous about cutting them too drastically, but I knew something had to be done. They were much too tall and threw everything out of proportion. Plus they were so spindly that I hated to look at them. I put my fears to the side and with the help of my good friends Jacques and Ken, began to cut. We removed twelve feet or so from the tallest tree at the back and cut others at different heights, so they would appear to be different ages. We cut the one closest to the front most drastically, leaving only about six feet. Here’s how the trees look now. 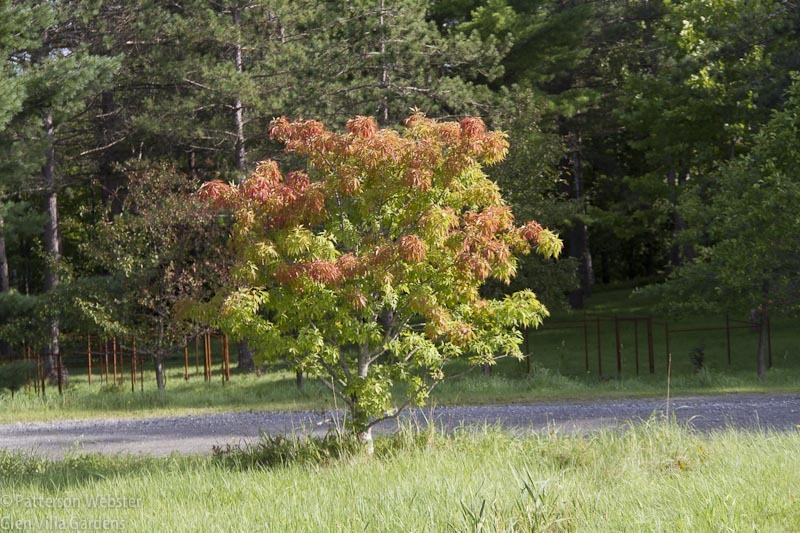 The same trees on the berm are now full and growing happily. It’s a BIG change and I’m very happy with the results. The trees are happy too — they are much fuller and seem all the better for the attention. Later this year we will cut the trees at the top of the berm to bring them down to a better height. 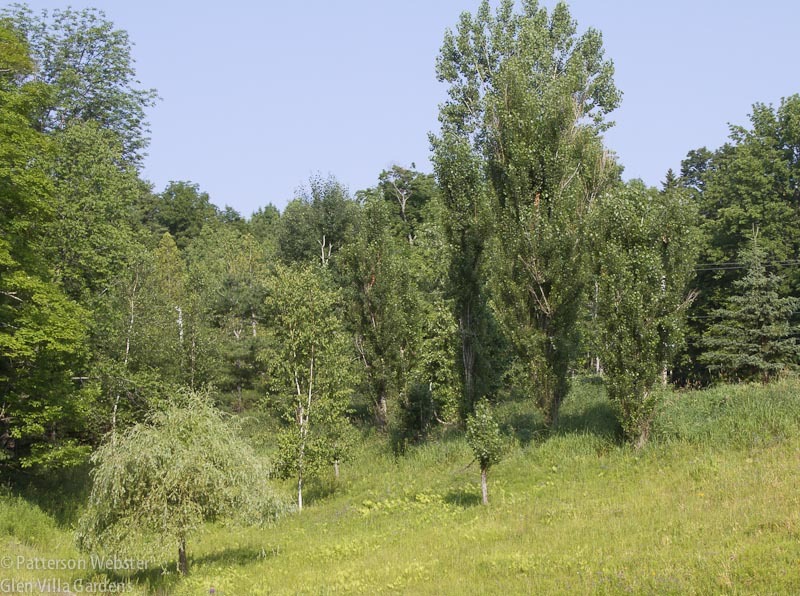 We’ve asked the municipality for permission to remove some pines along the bank of the lake — we need permission because they are in the riparian zone protected under provincial legislation. 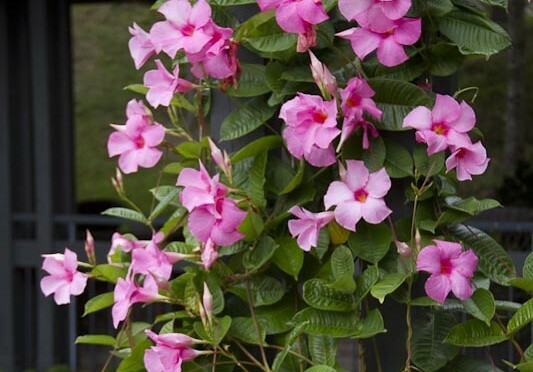 They are dying and I think it is better to remove them and replant rather than to watch them die a slow death. We’ve cut down some almost dead birch trees and some spruce that were on their last legs. And because of the amount of rain and high winds we’ve experienced this summer, many trees have blown over. Whether a tree is cut down deliberately or falls on its own, cleaning up the mess takes time. The new, more open view makes the work worthwhile. We’re planting replacements. Ken started this horsechestnut tree from seed two years ago and it is now growing in the Lower Field. 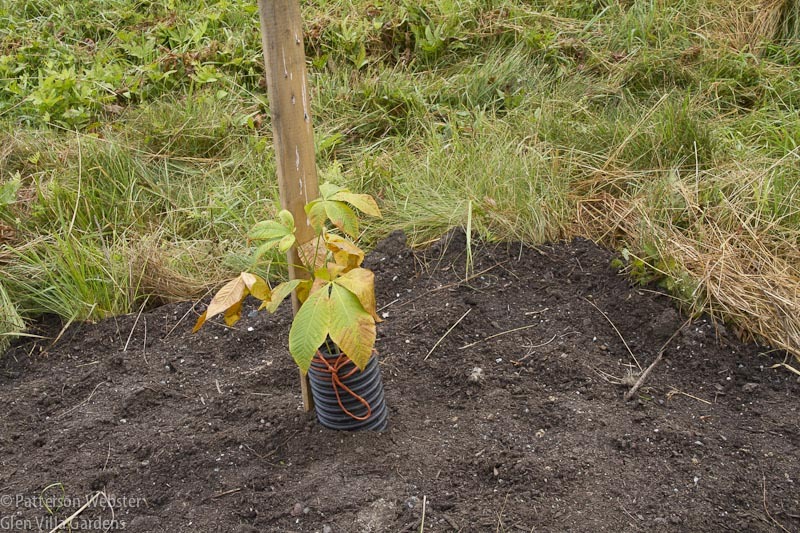 The tiny horse chestnut tree is looking a bit peaked in this photo, shortly after it was planted, but it perked up after a week or so. Not all dead trees need to be cut down. Several years ago, it was obvious that one of the old maple trees above the lake, near the path built in the days of Glen Villa Inn, was on its last legs. The following year it was dead. Before taking it down, though, I considered other possibilities. I had seen grass growing on the side of a building. Could I get grass to grow on the side of a dead tree? What if the grass slithered its way up the trunk, like a snake. A grass snake, made of grass. The idea made me laugh. And here it is, The Grass Snake. The apple is always out of reach. I install it annually, and every year I’m glad I do. It reminds me that the apple of perfection is always out of reach, that my garden is never the perfect paradise I want it to be. Trees inspire me, whether they are dead or alive. 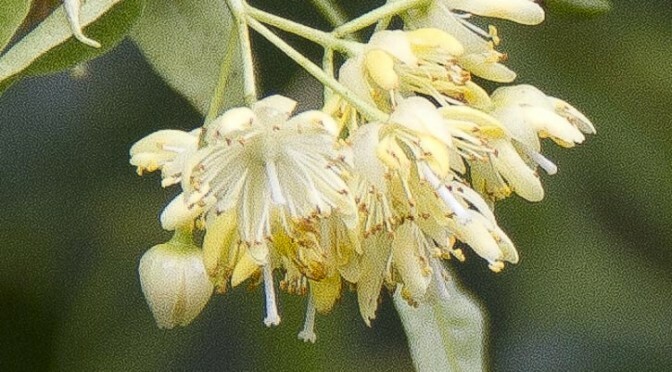 I have my favourites — the linden tree I ‘follow’ every month heads the list — but I love them all. I often wonder if the affection I feel is connected to the memory of a particular tree that grew at my grandparents’ farm in the Blue Ridge Mountains of Virginia. I’ll never know for sure, but I suspect that it is linked some way or another. Do you have a favourite tree? Do you have memories of trees you loved as a child? I’d love to hear your stories. 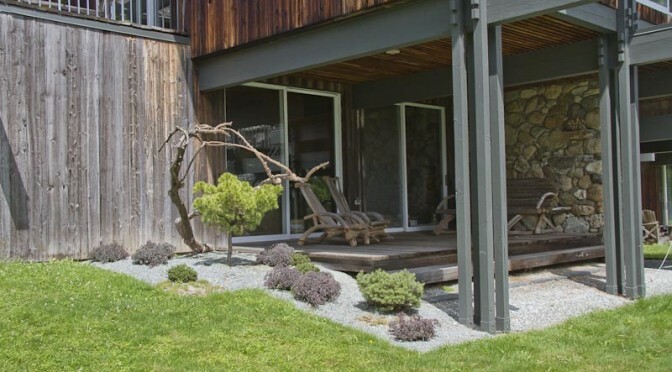 Beside our house, next to a wooden deck that is rarely used, is a juniper planted when the house was built in 1969. Or to put it more accurately, beside the house and next to the deck are the remains of one. For the last few years, the juniper has been slowly dying. 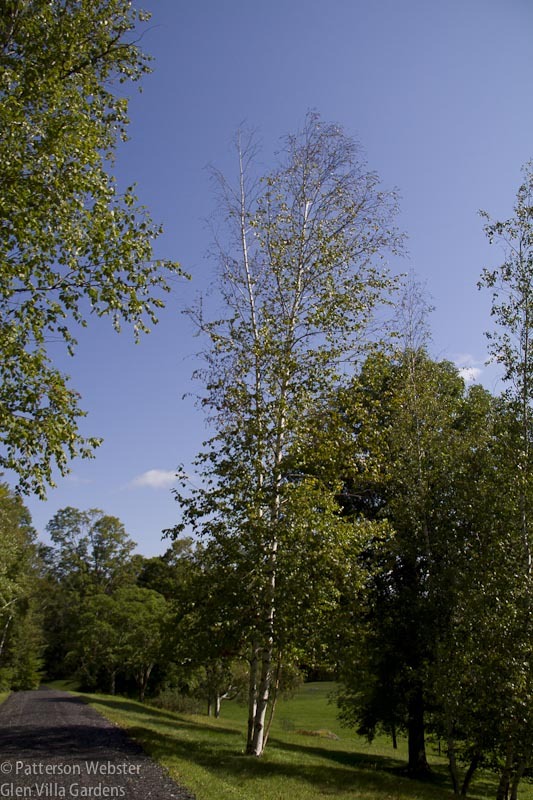 The photo below shows how it looked five years ago, shortly after I had pruned out an enormous amount of dead wood. To my eye it looked then a bit like a bonsai version of Tom Thomson's Jack Pine, minus the pretty colours.